V-Home of Vodafone is composed of a package of devices that can be expanded. Home automation is not something new, but it seems that at last the electronics industry is beginning to take it seriously to enter the home. A good example of this is Vodafone’s V-Home system, which has been presented in collaboration with Samsung. It consists of a package of four devices and several online services developed by this telecommunications operator. Spain is the first European country to which it arrives. The system is compatible with Android and IOS devices. 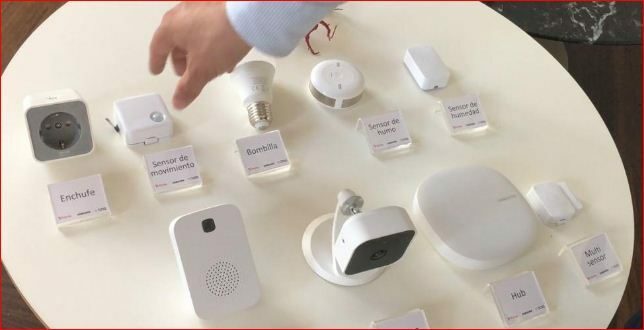 It is controlled through Samsung’s SmartThings platform and through Vodafone’s V-Home application. The installation is quite simple and can be done by any user, according to sources explained by Vodafone and Samsung in the demonstration that we attended. The so-called Safety Starter Kit comes with four devices and its cost is 300 euros. Although Vodafone offers the first 1,000 customers a 50% discount when purchasing a Galaxy S9, S9 + or Note8. In this way, the price of the kit would be € 144 without financing or € 0 of initial payment and 24 installments of € 6 per month. It is not necessary to be a Vodafone customer to enjoy the service, but at the price of the package, you have to add the payment of 7 euros per month. Although some Vodafone customers of the highest rates of the company can get the service for free or with a one-year test. As can be seen in the video accompanying these lines V-Home is not just a surveillance system, although this is a priori its main function. It is also possible to add other devices not included in the initial package in order to enjoy greater control over the household devices.